The devil isn’t the only one who went down to Georgia. Having had a gig-filled summer, we were looking forward to “time out” in December in Atlanta, GA to record our long-awaited CD. Music on the River in Mecosta, MI is “on again” and the park fills up for another free concert sponsored by the good townfolk of Mecosta. This year it didn’t rain and we got to watch the kids running and shrieking joyfully around the playground (and we without our water pistols!) as the adults enjoyed the show. The best part of the Mecosta stop, though, was the time we spent visiting with Ray and Alice. Ray is a country (and rock) music pro and host of one of the last—and best—remaining local broadcast radio shows; so he and Whitt always have a lot of tales to swap. After the concert, we spent a fun evening sitting around Ray and Alice’s with Polly and Mark trading tunes and jamming. 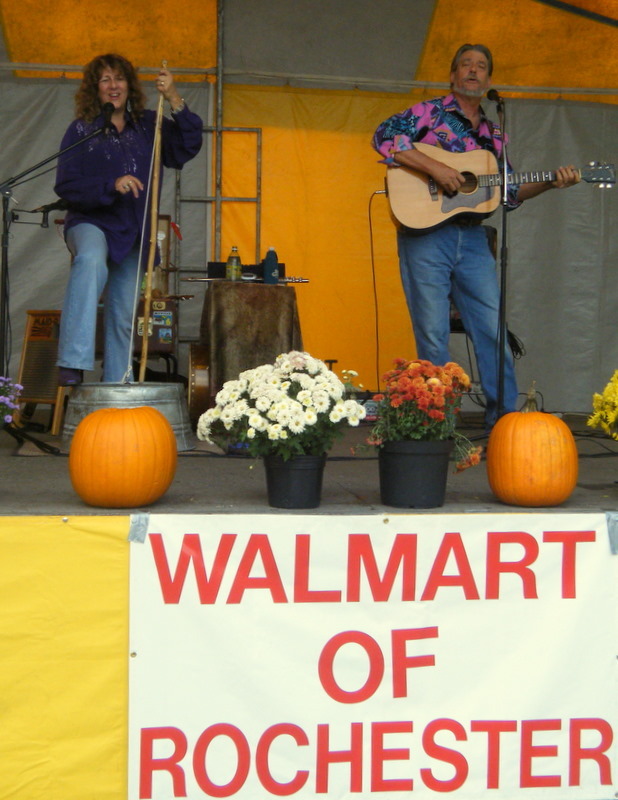 Fall would not be the same without the Kendallville Apple Festival and the Kewanna Fall Festival, both in Indiana, the heart of the heartland. Whitt claims the best part of his boyhood was spent outside Terre Haute, so he’s part Hoosier anyway. This year for Kendallville he set to music a James Whitcomb Riley poem, The Raggedy Man. Go to www.kendallvilleapplefestival.org and check out this growing event. Must mention the West Texas Bluegrass & Traditional Music Assn., www.westtexasbluegrasstraditionalmusicassociation.com ‘cause not only did they feed us like kings, they were one of the best, quickest audiences ever! Most significant to MWT insiders, they were excellent "bawkers"! (It’s extra fun for performers when a crowd really gets it, and this bunch had definitely caught something!) Great event with several rooms of jamming and a several good local acts before the touring act, guess whom…Of course, we’re talkin’ Lubbock, TX here—home of Buddy Holly, Mac Davis—well, you get the idea. There’s a vital live music scene there, and we hope to be back! We will try again in the spring after a couple of months warming up our voices (and bones!) in Florida. Happiest of New Years to you all! We hope to be seeing you in it! at 8:50 PM 0 Comments! at 7:43 PM 0 Comments! at 3:36 PM 0 Comments! Once in a while we get to perform at a community event. Of course, the more rural the community, the more wholesome and genuine the fun seems to be. Our list of favorite memories of such events will always include "Kewanna Fest," as a little Hoosier town eponymously calls it. at 7:35 PM 0 Comments! Are any of you are experiencing this? We turned around (and around and around) and it was July, of all months! in September, when we head south, stopping first in Indiana. a long and meandering route that included Hutchingson, KS, Lubbock, TX, Las Cruces, NM, and Tucson, AZ. We saw friends and family we had not seen in 15 or 20 years! Then we shot (or plodded) straight up to Eugene (as lush and beautiful as everyone says), and then straight across the northernmost tier of states, entering MI via the UP. DO NOT miss Yellowstone Park if you're up that way! We could say the same thing for Hutchinson, KS! Every state has it's own flavor, and there was nothing flat about the Kansas Good Sammers! 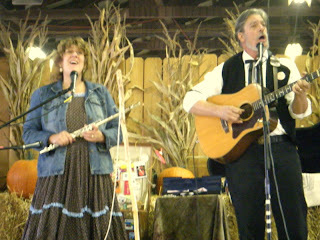 State Directors Nancy & Sonny Crook, took us right in (we love being taken in)! And a riotous time was had by all, which included multiple Paul Bunyan's, Babe the Blue Oxes (Oxen?) including a shovel of "Babe's" droppings tied to a string so it could be scooped up over and over! Oh yes they DID! In Lubbock, TX we met up with fellow musician and old friend Ron Huntley, whom we hadn't seen in 20 years, and who treated us like royalty...Let's just say we ate waaay too much of the finest Mexican food Texas has to offer!. When we got to Tucson to play the only gig we had booked (a wedding-timing problem) waaay up in the foothills, the guard at the big gate said "Name?" When he heard, "Whitt McKinney" he did one of those slow sitcom takes as he raised his head and said, "Whitt McKinney?!" Whitt then immediately recognized him as "Frank," the brother of Ron, whom we had bade farewell the week before in Lubbock. As we were setting up to play, a familiar face appeared in front of us. Having traversed the country, and met hundred of folks, sometimes it's hard to immediately recognize faces out of their context. When dawn burst upon the brain, we recognized that Sally Sulfaro, her son & talented musician Josh, and friend Judith from back in N. Michgan (and Noreast'r Festival fame) had come to see us & say "Hi." (Turned out the guard knew us so he let them in!) The more we travel the smaller the planet gets! Of course, Tucson (our hometown) has some of the finest Mexican food anywhere, and we did our part to help the economy and reduce the supply. well, we were forced by peer pressure and hospitality to eat waaaay too much wonderful Mexican food. Travel has proved very broadening for us. In West Palm Beach, FL, looking for a spot for our rig so we could go to a beach (for once, after months in FL), we followed some "public parking" signs that soon found us very out of place among swanky shops and automobiles the price of homes in Mt. Misbegot. A cop began to follow us, turn after turn, and then pulled us over. Turns out the officer was a very nice young man from Lewiston, a small town half an hour from the small town where we had lived in Northern Michigan! next to a very fine beach! Yee-Haw and Hallelu-Jah! Thanks to Officer Morine for aid and comfort in an intimidating environment...He is a credit to his department, and to small town upbringing. We have some Michigan gigs coming up, and hope to see and catch up with all the rest of our old friends. Seems most of our friends are old...what's up with that? Except YOU, of course, and we hope to see you, too! at 8:56 PM 0 Comments!